This is my design for a short crossover style jacket from Viking Hedeby (Haithabu). We made it for VIKINGS, an exhibition at the Australian National Maritime Museum in 2005-2006. I'm wearing it on our front page (sewing was by Hugh Griffiths - nice work Hugh). It is made of wool twill with raised nap (similar to duffel coat fabric), with a lining which could be a patchwork of wool offcuts, and trimmed with strips of very wooly fabric, brushed up to resemble fur. If you are hunting for Klappenrock patterns, then you will probably already know some of the how's, why's and when's. Maybe one day I will write more to explain how I deduced this pattern from these fragments - but in the mean time you will simply have to trust me - every detail does have a reason! Pete. For cutout refer to attached pattern. The fabric used is wool, 2/2 twill. Seam and hem allowances are all 1.5 cm unless otherwise noted. Stitch type is whip stitch unless otherwise noted, use doubled woolen thread. I. Hägg (1984 & 1991). Berichte über die Ausgrabungen in Haithabu vols. 20 & 29. Textile fragments H11, H19, H76, H77, S28, S46. 1. Sew flaps to front of garment. Fold tip and edge G-H of flaps inward. Sew over vent in front panel G-H, as in seam diagram I. 2. Sew shoulder seams. Sew front panels A-B to back panel A-B, as in diagram II. 3. Sew arms in armholes. Match halfway point B on arm to shoulder seam A-B. Sew arm to rear panel from B to D, as in seam diagram II. Sew arm to front panel from B to C. Note that C marks the top of a fold forming the side of the garment. 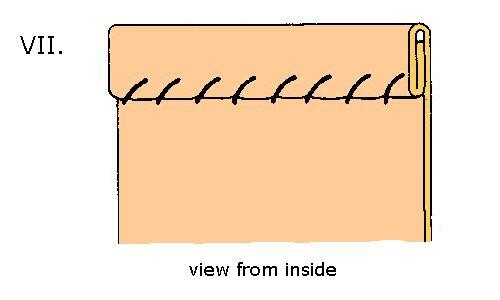 Make the fold, then sew from D to C on the back, as in diagram II. 4. Sew side seams. 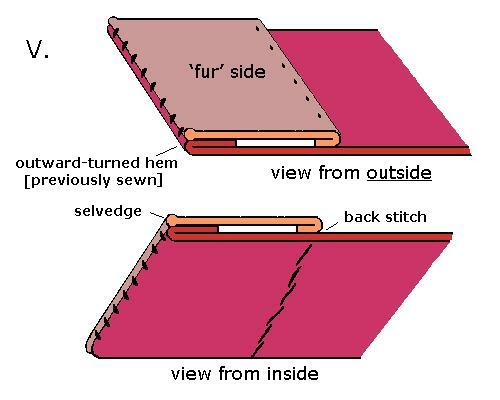 Sew front panels to rear panel, C-E as in diagram II. 5. Arrange the front panels. Open vents to approx. 20-degree angle so that the lower hems of the front panels are horizontal and the front edges cross over correctly, as shown in front view. 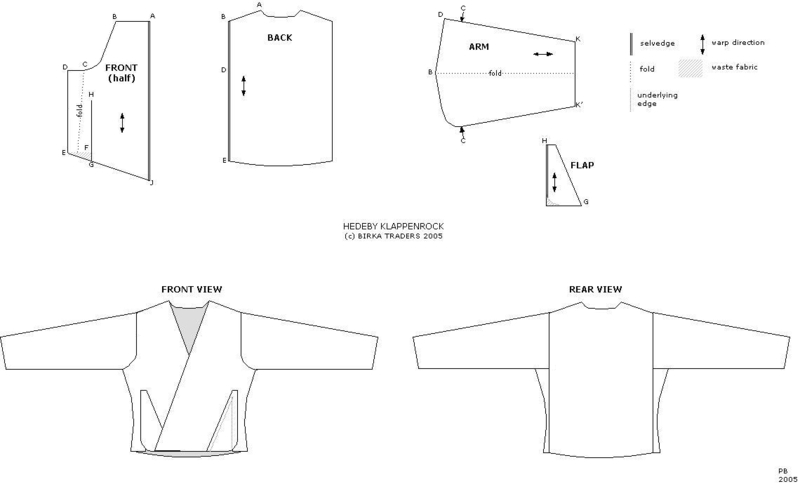 On front panels, trim edge E-F back level with lower edge of rear panel, then roll edge of vent F-H under to make a narrow hem, like in diagram III. 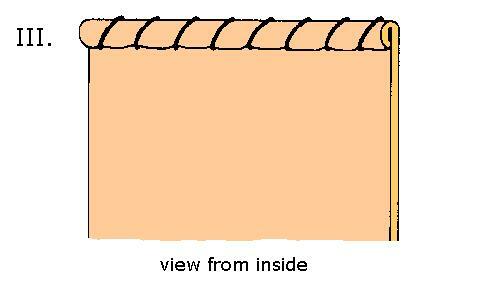 The unsecured top of the flap can then be sewn down parallel to edge H-F, leaving the bottom 20 cm open. 6. Lower hem. This hem will be covered by the fake fur border strip. Fold to outside of garment, making a deep (1.5 cm) hem, as in diagram IV. At the flap, taper the hem to zero width about 15 cm above the lower edge. 7. Fake fur lower border. The trim was made from a coarse woolen fabric which already had one fluffy side, by brushing up the pile with a wire brush. Sew 6 cm wide strips from point J on the front panel across to G, continuing around the edge of the flap and up the vent to about 20cm above the hem line. 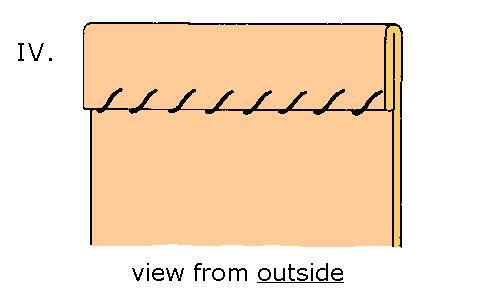 Another strip runs along the back panel and ends at the vents, point F. The construction is shown in diagram V, note the raw edge of the strip is turned under and caught by a back stitch worked from the inside of the garment (this later gets covered by the lining). 8. Fake fur border, front opening and neckline. This strip can be attached in the same manner as the others, or if additional coverage is needed at the front it can be attached edge to edge, as shown in diagram VI. 9. Sleeves. Close the long seams C-K as in diagram II. However if you wish to line the sleeves, dont sew them up until after step 10. Fake fur trims at the cuffs are optional. 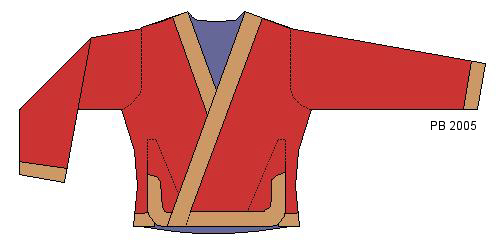 If trim is not used the cuffs should be turned in twice and hemmed as shown in diagram VII. 10. Lining. The lining (in my case, of fine herringbone wool) is cut smaller than the outer layer, it it is turned under and sewn down 2 cm from the front and lower edges of the jacket. The lower margin appears to be just whip stitched, but on the front edge a second line of stitching, probably running stitch, is added (diagram VIII). There is no evidence to show whether the lining finished at the armhole seam or continued down the sleeves - Im assuming only the body was lined. 11. Fastening. The garment was probably belted, or instead or additionally, pinned with a dress brooch near the hip. This is suggested by position of brooches found in some Birka graves. Hedeby Klappenrock, written and webbed by Peter Beatson. (c) Birka Traders 2005-2009. Not to be copied without permission.